A frozen pond or lake offers so much fun. Dig out the sleds and skates and it’s time to have great fun gliding and sliding. This charming Ida Waugh (1846-1919) drawing from 1892 captures that feeling perfectly. I love these sweet scenes of children playing together. In one part of the picture we have a young boy in a woolen suit with red and white strips on his scarf and socks. 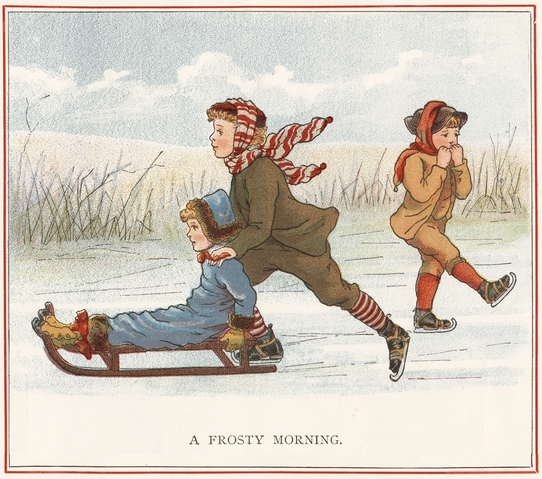 He’s on skates and pushing his sister, dressed in blue, across the ice. Nearby is another child in a light brown suit, red socks and red scarf. He’s feeling the cold and blowing on his fingers to keep warm. Too bad none of the children have mittens.